WhatsApp status has truly caused problem in relationships, most often, your WhatsApp status is misunderstood and taken wrongly. Other times, you truly want to share some Quotes or burn fingers, but certainly, there are some persons who should not see it. So this article is for all those, who are not yet aware of the fact, that they can easily hide their WhatsApp status updates from certain persons. 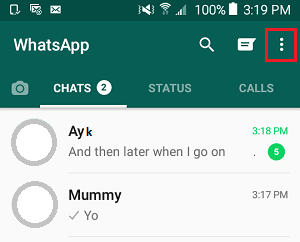 It is very much possible to configure WhatsApp Status Updates to be seen only by certain people in your Contact List who you will select. 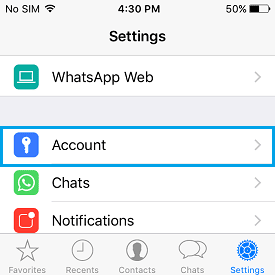 Below, I have a step by step guideline and procedure, on how to Show or Hide WhatsApp Status Updates from specific contacts on iPhone and Android Phone. 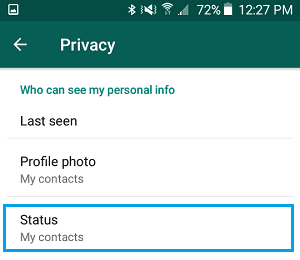 Follow this guide, which will show you, how to hide WhatsApp status update from some contacts on your list. Just in case you are not aware, WhatsApp now allows you to share Photos or Videos with all your Contacts in the form of daily Status Updates. These Status update, either it’s photos and/or Videos automatically last for 24 hours only, and after that, disappears automatically. 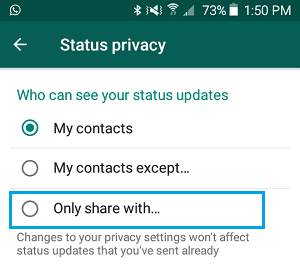 However, through default settings, your WhatsApp Status Updates are set to be seen by all your Contacts on your list, and this has turned to a nightmare for some users. Several users of this chatting App, are mortified about this and do not like the idea of sharing their daily WhatsApp Status updates with everyone in their contact list. After several complaints and to make things easier for their users, WhatsApp has made it easier for all users on their platform, to configure who sees their status update. This setting gives you the power to select who sees your Update, and who should not be notified or see it. The first guide here is for all iPhone users. 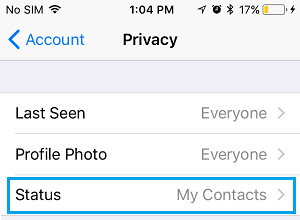 In this guide, I will be showing you, how to hide your WhatsApp status updates from selected contacts on your iPhone and/or iPad. 2. Next, tap on the Settings icon located at the bottom right corner of your screen (See image below). 3. The 3rd step is to tap on the Account option, as shown below. 4. 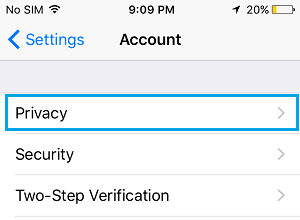 On the Account screen, you need to tap on Privacy. 5. When the Privacy screen opens, you simply need to tap on the Status option. 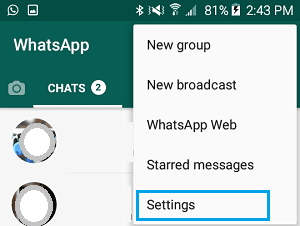 After this setting, your daily WhatsApp Status Updates will be hidden from Contacts that you had selected in the steps above. The step above guides you on how to hide your status update from specific persons on your contact list. 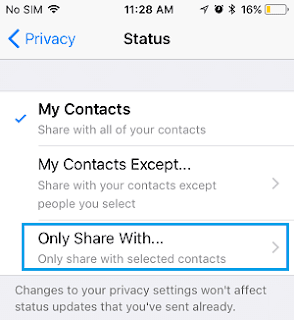 But this tutorial below will be guiding you on how to Share or Show WhatsApp Status Updates only to selected Contacts on your iPhone or iPad. 1. Tap on Settings » Account » Privacy » Status. Just follow the above step 2, 3, 4 and 5. 2. 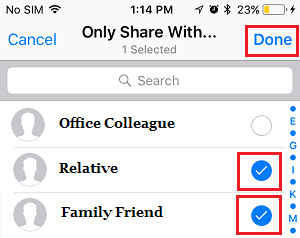 On the Status screen, tap on “Only Share with…” option as shown in the image below. 3. 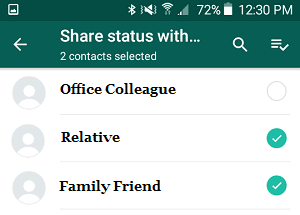 When you have tapped on “Only Share With…”, you will be taken to another optional screen, here on this next screen, you should tap only on those Contacts with whom you want to share your WhatsApp Status Updates, as shown in the image below. 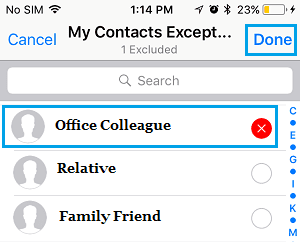 When you have selected the contacts of those who are allowed to see your status Update, on the top right side, tap on the DONE button, and it will be saved. The two guide above, gives you a detailed procedure on how to Show/Hide your WhatsApp status on iPhone and iPad. There is a huge difference, as the same settings cannot be applied on Android phones. 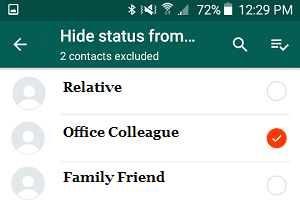 To hide your WhatsApp status from some certain contacts on your list, follow this guide below. 2. Next, tap on the 3-dots icon which is located at the top right corner of your screen, as shown in the image below. 3. After tapping on the 3 DOT Menu, you get to see a drop-down menu on your Android device, simply tap on the Settings option as shown in the image below. 4. When the Settings screen loads, tap on the Account option as shown in the directive image below. 5. When the Account page loads up on your mobile phone, tap on Privacy. 6. When the Privacy screen loads up on your device, simply tap on Status as shown in the Image below. 7. 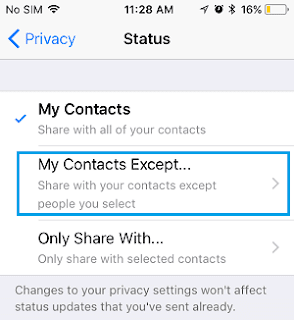 When the Status page opens, all you need do is tap on My Contacts Except… option as shown below. 8. 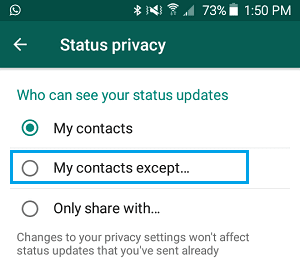 Lastly, on how to hide WhatsApp status on Android for some users, you need to tap on the Contacts that you wish to hide your status Updates from, as shown in the image below. This post below (picture inclusive), will be showing you, how to show your WhatsApp status to some selected Contacts on your list, while the others on your list who you didn’t select, won’t see your status updates, even if they visit your profile, clicked on your DP. They won’t even receive notification that you’ve changed your status. 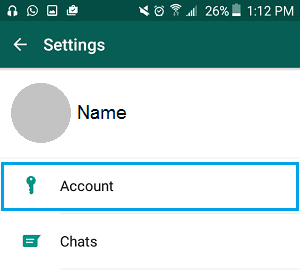 This tutorial below will show you, how you can share/show your WhatsApp Status updates only to contacts you select on your Android smartphone. 1. 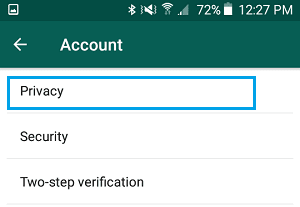 Tap on Settings » Account » Privacy » Status as shown in the above step 2, 3,4 and 5. 2. On the Status screen, tap on Only Share with… option as shown in the image below. 3. When you tapped on the “Only Share With…”, take note that on the next screen that loads up, simply tap on the Contacts who you want to share your WhatsApp Status Updates with. The ball is in your court, you can now choose who to share your whatsapp status update with, or who to hide it from. Hope with this guide, you get to fully understand that WhatsApp respect your privacy.